Brief Description: Pale, matted circular patches several inches in diameter, with pinkish, salmon-colored or rust-colored edges. Pink Snow Mold is a fungal lawn disease caused by the fungus Microdochium nivale. It is one of two types of snow mold. 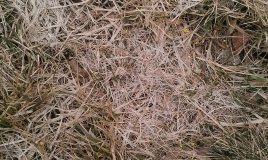 The other type, called Gray Snow Mold or Typhula Blight, often occurs in conjunction with the pink variety and is less harmful to turfgrasses. Both types of Snow Mold occur when heat and moisture become trapped beneath a layer of snow, creating ideal conditions for the fungus to grow in. Pink Snow Mold harms turfgrass by attacking the roots and the crowns of the grass, which does longer-lasting damage to your lawn. Both Pink and Gray Snow Mold are capable of invisibly surviving the summer in the form of fungal spores to appear again the next spring. This lawn disease usually appears in the spring, as the snow melts and reveals the disease that has been thriving underneath. At this point, the colors of pink snow mold will be the most vivid. 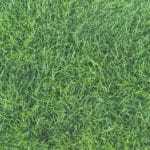 As the grass dries, the colorful mycelium or fuzzy, mold-like coating that gives the grass its matted appearance starts to fade. 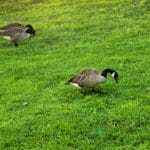 As the weather warms, the circular patches of grass affected by the disease will die, leaving brown patches that, depending on the damage to the roots and the size of the affected area, may need to be reseeded. 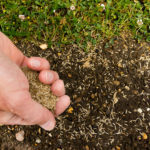 It is important to remember that, even if the patches do grow back over the course of the year, the mycelium or spores may still be present in the lawn, and are capable of surviving warmer conditions. Preventing Pink Snow Mold if you’ve never had it before is generally as simple as preparing your lawn for the winter in such a way that warmth and moisture are less likely to get trapped beneath falling snow. In the autumn you should carefully rake up the leaves that fall and remove any unnecessary items from your lawn that may get between your grass and the snow, such as fallen sticks, pine cones or wading pools or waterslides no longer in use. 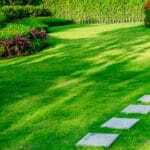 Clearing the lawn of debris will prevent warm “microclimates” from forming underneath them. If you have had Pink Snow Mold before, chances are the spores are still present in your lawn. In order to eradicate them, a fungicide treatment may be required. As with most fungal lawn diseases, Pink Snow Mold may require more than one treatment to eradicate completely.